Can almost hear Kimi mutters beneath his breath "easy Ldm...don't touch me...keep the hand away!" Thanks everyone for the updates & pictures! This just keeps on getting more interesting. It seems like Kimi is really going for this challenge. Many thanks for the article, miezicat! Am I the olnly one who would faint , if Kimi showed up with that suit and that car to offer me a ride? 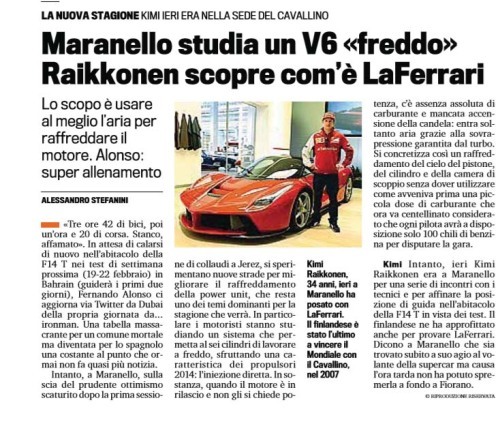 Maranello, 13 February – A second day in Maranello for Raikkonen. For much of the day, Kimi worked on the simulator, recreating the conditions he will experience in the F14 T in Bahrain for next week’s second test of the 2014 season from 19 to 22 February. During a break, Kimi decided to take a stroll through parts of the factory he hadn’t seen for years, starting with the production line for the 8 and 12 cylinder cars, before visiting the engine assembly area and the styling centre. Kimi has always been interested in the technical side of cars and he had plenty of questions regarding the manufacturing and styling ideas for the Ferraris of the future. The Finn, who won the championship in 2007 with Ferrari, had his photo taken with the employees who gathered around. Apart from the inevitable requests for autographs, he was also exhorted to repeat his 2007 feat! as i said, i get the feeling Kimi is very much welcome in ferrari. maybe they are fed up with someone else? ......and thanks miezi for the magazine post and the videos!